Attention all Artists, Collectors, Craftsmen, and Entrepreneurs: Share your passion with our customers! Join our TEAM! BIG NEWS! The basement at In Your Wildest Dreams is getting ready for remodel. 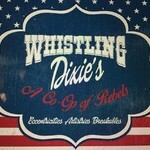 We are very excited to announce the addition to our In Your Dreams Family, "Whistling Dixie's"
Dare to be different. Join like-minded people and share your craft and passion with Kern County.Whistling Dixie’s Co-Op gives local vendors an opportunity to showcase their unique art, craft, or collection. Shopping local for unique items is made possible all under one roof. Our goal is to offer an outlet for local talent and collectors to showcase and sell their merchandise. We invite you to be a part of our movement, where friendships are created, and rebels play and sell. BE YOU. BE A REBEL. In business for over 13 years and has developed deep roots in the community. In Your Wildest Dreams, home of Whistling Dixie’s aggressively advertises on TV, Radio, Social Media, and in local magazines and newspapers. Hosted events: Sip and Shop, First Friday, Bakersfield Amazing Race, etc. Reserve Your Space Today! Call Ginger at 805-1064 or Candace at 932-5903. SHARE IF YOU SUPPORT LOCAL BUSINESS AND LOCAL TALENT!